Why we should have a Websites? It is an easiest way of showing your business to the people all around the world. There is 4.7 billion searches per day. When people search for a business like yours, they cant find your name. Website will helps your business gains popularity and also in improving the sale of your products/services. 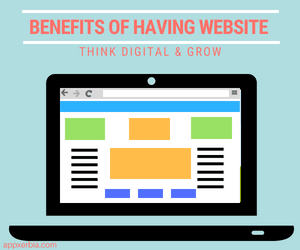 Therefore, it becomes an essential to have a website in this digital world. Anyone residing in any part of the world can gain ease of reviewing about your products and services 24/7/365 even when you are not on your desk. Providing information takes time whether it’s done over a call, face-to-face or on emails. With an on-line catalog in the form of website you can share lots of information about the products and services offered by you. Once your website is running, it is available to your customers and will help you in saving time. As compared to brochures and catalog, website is a much easier, quicker and cost effective way of updating information about your products and services letting your customers know about the arrival of new products, forthcoming events or special promotions/sale/discounts. No matter what type of business you are occupied with, a website is a great place to showcase your work. By adding a portfolio or image gallery as well as testimonials about your work on website you can display what makes you different from others. Today customers use Internet to search for products or services they need. By having a website your business will gain credibility. If you don’t want your potential customers to go to your competitors for getting their work done, get your own website designed with a team of experts and give your website a professional look.